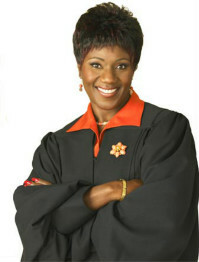 Judge Mablean Ephriam was born to Robert and Mable Ephriam in Hazlehurst, Mississippi. She is no stranger to achievement. Through hard, consistent and dedicated work, she strives to perform and do her God-given best. Since a child, she has always had that “spirit” of excellence and liberality about her. The ninth of ten children, you could always find her somewhere reading, studying, and asking countless questions that could drive you crazy. When she wasn’t doing that, she could be found fighting for the rights of strangers and family members. Her strong thirst for knowledge, equality, and unselfishness, led to a rewarding, challenging and sometimes agonizing career in the practice of law. At the age of 13 years, she knew she wanted to become a lawyer. She set a plan in motion and went to work — allowing no obstacles to defeat or dissuade her. She attended Thomas Jefferson High School in South Central Los Angeles, graduating with honors. She received a four year academic scholarship to Pitzer College, Claremont, California, for her undergraduate studies. At the conclusion of her undergraduate school, Judge Mablean then took a break from school. She married and became a wife and mother and entered the work force. In anticipation of her future in law, Judge Mablean began her employment career as a Correctional Officer for the Federal Bureau of Prisons in the Women’s Prison at Terminal Island, San Pedro, California. After about two years, she took a job as a legal secretary in the Law Offices of Eric Parkan, Beverly Hills, California. There, she became skillful in preparing documents for civil litigation and workers’ compensation and gained further practical skills that would be helpful to her in her ultimate career as a lawyer. In 1974, Judge Mablean decided that it was time to enter law school. She applied and was accepted to Beverly Rubens School of Law (now known as Whittier college school of Law) in Los Angeles, California. While attending law school, at night, she worked during the day, at the Law Offices of Stanley Sanders and Sandy English as a paralegal. There she engaged in researching and drafting contracts and partnership agreements in corporate and business law. In 1976, while still in law school, remaining focused, Judge Mablean became a Certified Law Clerk at the Office of the City Attorney of Los Angeles, where she researched, wrote and argued criminal misdemeanor appeals before the Appellate Court. At Whittier College of Law, she participated in Moot Court. Her team won second place in the California statewide Traynor Moot Court Competition. Judge Mablean received her Juris Doctor degree from Whittier College school of Law in 1978. She was admitted to the state Bar of California in November, 1978, having successfully passed the State Bar examination the first time. Judge Mablean was able to accomplish her goal to be a lawyer, without neglecting her family and making sure that her children did well in school. The completion of law school was just the beginning of an illustrious legal career, heightened by countless awards and recognition. Association of Los Angeles (WLALA); 1990 Outstanding Leadership-Board of Directors, Harriet Buhai Center & Outstanding Contribution to Pro Bono Legal Services-Board of Governors, California State Bar Association: 1985 Outstanding Service-National Association of University Women and the 1978 Achievement Award-State Youth Department, Churches of God in Christ 1st Jurisdiction. If that is not enough, Judge Ephriam has volunteered in numerous organizations and worked many jobs, such as: Hearing Examiner-City of L.A. Civil Service Commission; Board of Directors-Union Rescue Mission (first black woman); Member of American Bar Association and National Bar Association; Lecturer-Upward Bound Program, CSUBL; Motivational Speaker-L.A. City Schools; Co-Founder-Harriet Buhai Center for Family Law which provides free legal services for economically disadvantaged persons); Board of Directors-Southern California Women’s Dept./Retirement Center Committee, Churches of God In Christ – So. Calif. 1st Jurisdiction, Advisor to Pastor Ron Hill-Love and Unity Church of God In Christ; Member and Past President of Black Women Lawyers Association of Los Angeles (1982-1983). In October of 1998, Twentieth Television selected this experienced, distinguished law practitioner and mediator to sit as Judge on the newly, revised half hour syndicated show “Divorce Court”, where there was no script, nor actors, just real cases and real litigants with Judge Mablean rendering legally-binding decisions. This all came about by God’s divine will. Judge Mablean did not seek the position. Through word-of-mouth regarding her legal talents and referrals from strangers, Fox executives interviewed Judge Mablean and liked what they saw. Within seven (7) days signed a contract to be the Judge of the television show, Divorce Court. Thus, the beginning of her career in entertainment. Judge Mablean presided as the Judge on Divorce Court for seven seasons, (1999-2006) She is truly grateful to have had this experience. She is now a much sought after public speaker for Women’s Conferences, Churches, Community and Civic Organizations, Colleges and Schools, dealing with relationship issues and motivating others to pursue their dreams. Additionally, she is working on the mission of her nonprofit foundation, The Mablean Ephriam Foundation, to build stronger families, educate minds, increase economic power among disadvantaged and lower economic persons and thus create better communities. She is most thankful to have been given the opportunity to provide day-to-day care to her mother, Mable Ephriam, until her death, at the age of 98 years, on February 9, 2010. This hard-working woman is an entrepreneur. She is the co-owner of Jubilane Guest House, a Bed & Breakfast in Johannesburg, South Africa; and founder of an awards program, Honoring Unsung Fathers (H. U. F. )Scholarship and Awards, through her non-profit, the Mablean Ephriam Foundation. Judge Mablean attributes her success to God, her family and close friends. Her faith, religion and trust in God keep this mother of four and grandmother of ten, meek and humble.